What do you do when a long chain of marbles is inexorably rolling towards a secret chamber and you can’t let them reach it? That’s right, you shoot those marbles with other marbles in order to remove marbles. Sounds silly, but that's how it is! Aim with your Tiki stone to shoot marbles of the same color into the chain. If you match 3 or more marbles they will disappear. Bigger combos will grant bigger bonuses and even specials. And if that’s not enough for you there are power ups that will assist you greatly in your challenge to eliminate brightly colored rolling marbles. Of course there are power ups. 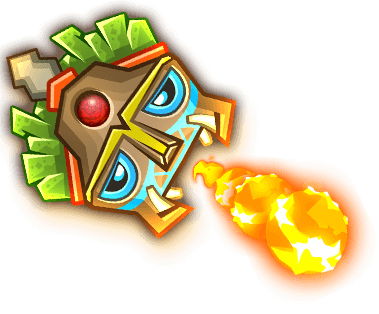 For example there is a fire power-up that will allow you to spit awesome fire balls for a short amount of time and destroy all marbles that get in the way. No need to match 3 marbles, just shoot fireballs wherever you want. Another fan favorite is the lightning power-up that will randomly shoot lightning beams and destroy several marbles across the screen at once. A really helpful feature is the option to swap between two marbles before every shot. If you don’t find a good spot to shoot a marble, swapping may give you a big advantage. But either way your one and only goal is to destroy the whole chain of marbles before the first marble reaches the exit. So your main antagonist is time. And your aiming skills, of course. Totemia is the perfect game for all Match 3 fans that want a little more action and excitement. As a classic marble shooter it adds a time component and a lot of levels to master. It’s a marble game that is as action-packed as it is challenging. A puzzle game for kids, adults and everyone in between. The Match 3 game for people with a quick finger and evenly quick thinking skills. Totemia: Cursed Marbles - Find Totemia: Cursed Marbles in our vast HTML5 games catalogue. Only the best and newest HTML5 games for all audiences. Guaranteed success with Famobi.